...It's seeing clearly, comfortably, and functioning fully. Many people can see the smallest line on an eyechart but can't visually function well. Vision Therapy may be necessary for focusing, eye movement, and perceptual problems. To get from seeing to real sight may need a program of exercises to help you reach your real visual potential! Below is an exercise you can try. Hope the below listed instructions are helpful. You must be able to see with two eyes to see these pictures in 3D. You will need to point your eyes about 10-12 inches from your eyes (use a pencil or something initially). Move the pencil back and forth until in the background you see three images (3 fireplugs). At this point stop! The pencil will be clear and you'll see three fireplugs but the fireplugs will be blurry. Here's where you come in! 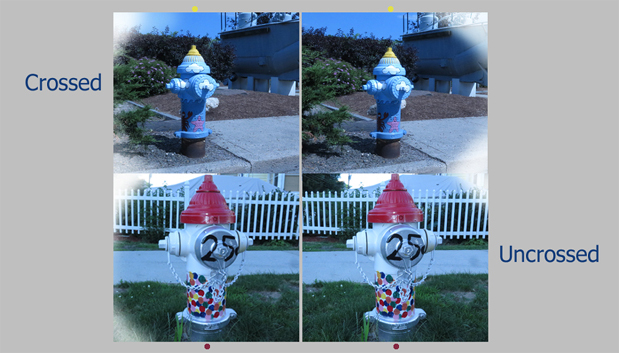 Keep your eyes pointed at the pencil but now 'release' your focusing and make the middle fireplug clear. When you do, you'll see the image like you're standing infront of it! You'll need to look past the image on the screen until you see 3 images of the 'Uncrossed' fireplugs. When you have three stop! Here's where your focusing comes in. 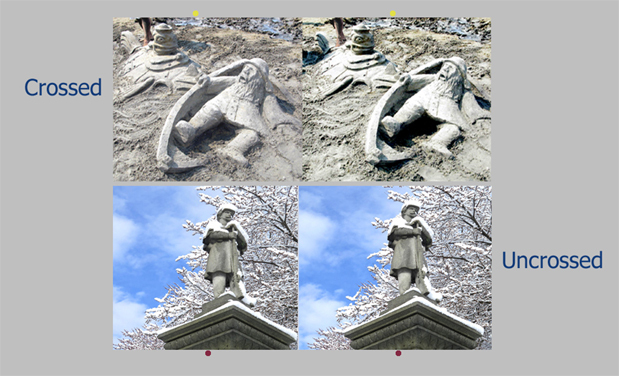 Make the middle image clear by changing only your focusing but not the eye pointing. When you do, it will appear in 3D. 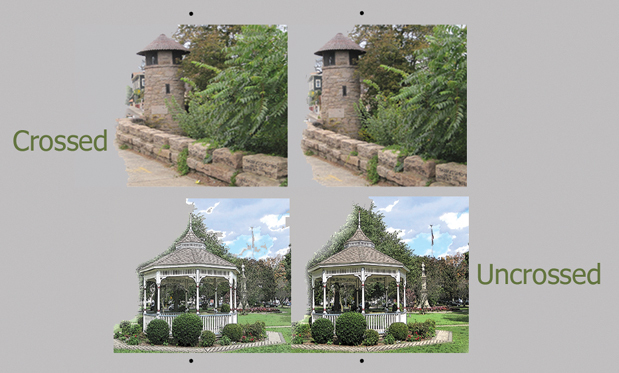 To see these images in 3D you must have the ability to see with both eyes and have a good focusing and pointing system. If you haven't had an eye examination in the last year, you can book an appointment in our office or see your own eye doctor. You can show your eye doctor this page and ask about it. It's good therapy and it good for good eye functioning! 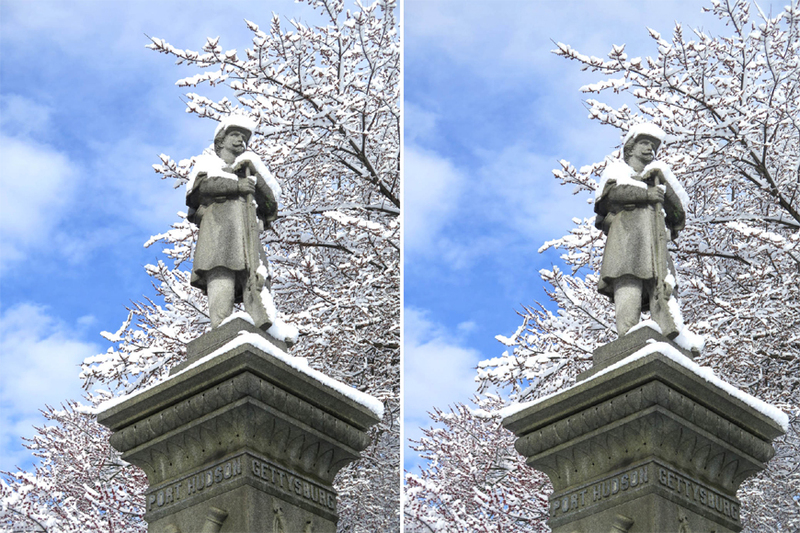 Crossed Picture of Statue on the Green with Spring Snowstorm on March 21, 2016 below! Great Uncrossed image from Great River Golf Course March 21, 2016. Mondo Ponds in Milford, CT - a summer morning walk through the park. View of Charles Island from Silver Sands State Park boardwalk in Milford, CT. Early morning sunrise at Mondo Ponds in Milford, CT just before the clouds roll in for an overcast day. View of Charles Island from Fort Trumbull in Milford, CT in winter. View of Wepawaug Bridge under the train tressle on Prospect Street. I doctored this image to get rid of wires and roof fans! View of Mondo Ponds in Fall 2016 - just before the leaves fell. A wild turkey in a side yard October 2016 showing it's feathers! Closest view of the moon in November 2016. Swirl of leaves at Mondo Ponds - shot at about a 30th of a second rotating the camera circularly. A beautiful early morning late March snowfall. Snow was gone by noon that day.